Though it’s deeply rooted in the arcade tradition, THOTH also brings something unique to the table. Each stage in the game is specifically designed to require both puzzle solving and finesse to get through. Players constantly need to think about positioning and timing while making sure to both dodge enemies and avoid collisions. Aesthetically, THOTH is a vibrant rush of colors, shapes, and patterns by artist Niels Fyrst, accompanied by a brutal soundtrack from electronic music pioneers Cristian Vogel & SØS Gunver Ryberg. The imposing aesthetics and the relentlessly demanding gameplay eventually induces a trance-like state in the player. THOTH is out now on Steam, and Humble, with a 20% discount in launch week. Pre orders for GNOG will start soon, watch the new trailer! Double Fine Presents puzzler GNOG is headed to PS4, PSVR and iOS PC early next year, and Playstation pre orders will go live next week offering a 10% discount on the game. The team at KO_OP would like for you to see their new trailer, so please press play below and be transported into a colorful world of monster heads. 140 is out today on Xbox One! Our latest Double Fine Presents game 140 is out today on Xbox One, with PS4 and Wii U versions following suit by this time next week. Created by Jeppe Carlsen (Lead puzzle designer, Limbo, Inside) with Music by fellow Playdead colleague Jakob Schmid, 140 is a challenging minimalistic platformer with abstract colorful graphics. You’ll need rhythmic awareness to overcome obstacles controlled by an energetic, yet melancholic electronic soundtrack. 140 will also be out on Wii U later this week and PS4 Next week, with 3DS and PS Vita versions coming later this year! Come and see us at PAX next weekend! We’re heading to PAX West in Seattle next weekend, come and find us at booth 106, in the usual spot right behind PlayStation. At our booth you shall find SE7EN games to play: five Double Fine Presents games—Gnog, Everything, Gang Beasts, 140 and a new one we’ll be announcing on the first day of the show—plus two of our own, Headlander and Psychonauts in the Rhombus of Ruin! As always our booth-side store will have many delights on offer, including some excellent new items making their debut at the show. Amongst those things are two new official Pinny Arcade pins offering you the chance to express two very different emotions. For those feeling BRUTAL we suggest displaying the shiny chrome effigy of the Eternal Fire Beast Ormagöden upon your body. But for those in a happier mood, the welcoming face of a Hexipal is sure to win you affection of many kinds. We’ll also have a few remaining pins from last year around, but we don’t have many left! New 2HB tees available in an array of sizes, grey and black version in long sleeves, sepia version in short sleeves! We’ve been working with our friends at Iam8bit to produce vinyl edition soundtracks for both Broken Age and Psychonauts. These will be available for all after PAX, but special editions of each will be available first at PAX, limited to 500 of each! See over here for more info. 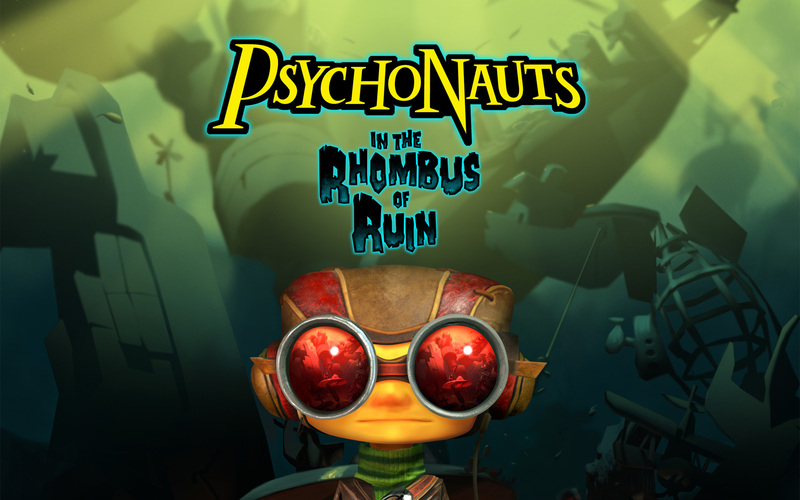 Mr Tim Schafer will be around at the booth from time to time, please say hello if you spot him! We’ll also have daily signing sessions on Fri, Sat and Sun afternoons, so bring anything you want signed, or pick up something new at the booth! 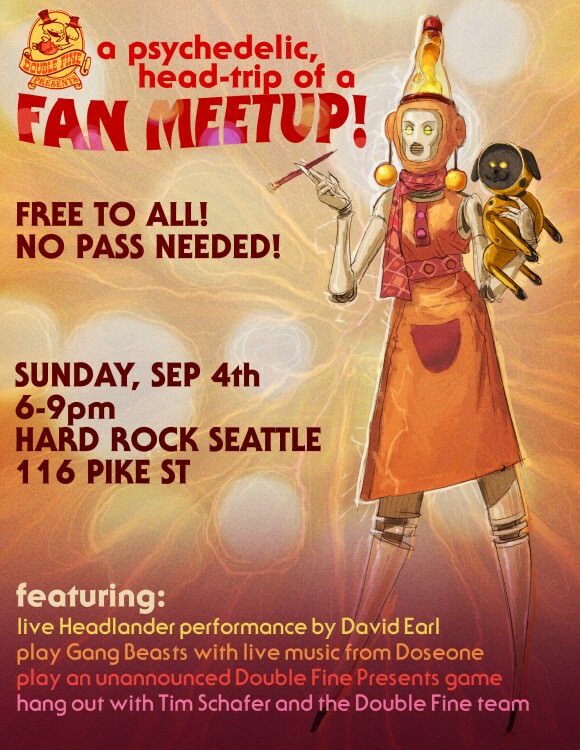 On Sunday Sept 4th we’ll be hosting our annual PAX meetup at Hardrock Seattle on Pike St. We’ll have games to play, friendly faces to talk to, and live music from Gang Beasts composer Doseone, and Headlander composer David Earl! Come along, bring your friends, the party is open to all, no PAX Badge required! Together with our super pals at iam8bit we’re going to be releasing Peter McConnell’s fantastic Broken Age and Psychonauts soundtracks on vinyl! 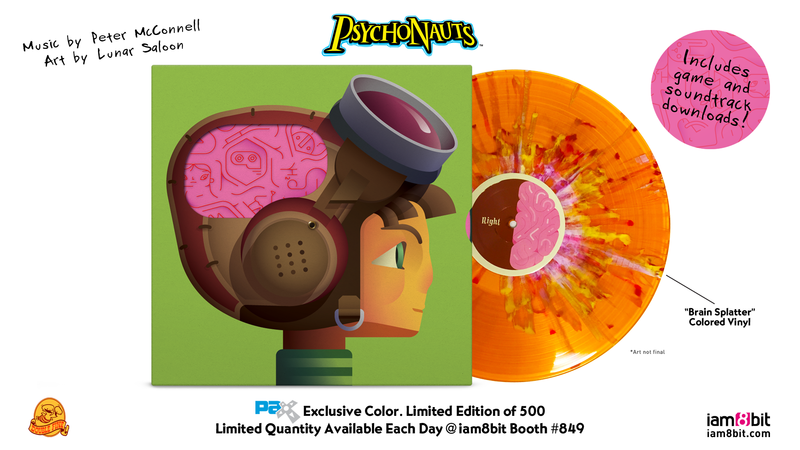 Both the soundtracks have been specially mastered, and will come on gorgeous coloured vinyl with a digital download of the game itself, and the soundtrack too. 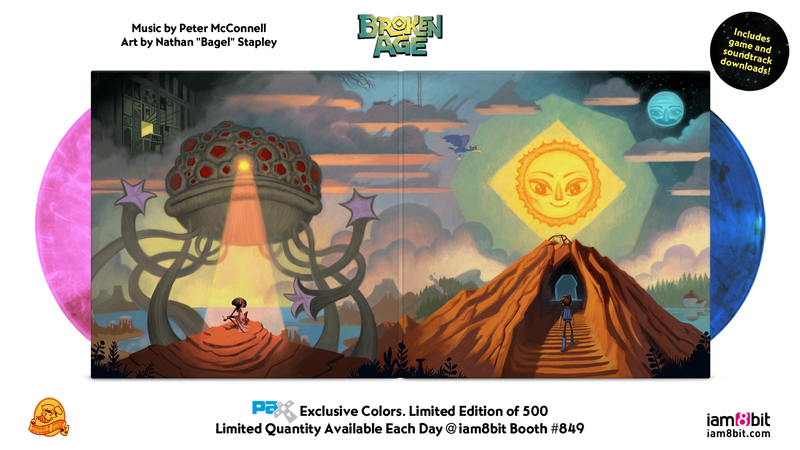 You’ll be able to pre order them soon from the iam8bit store, $35 for Psychonauts and $40 for Broken Age. 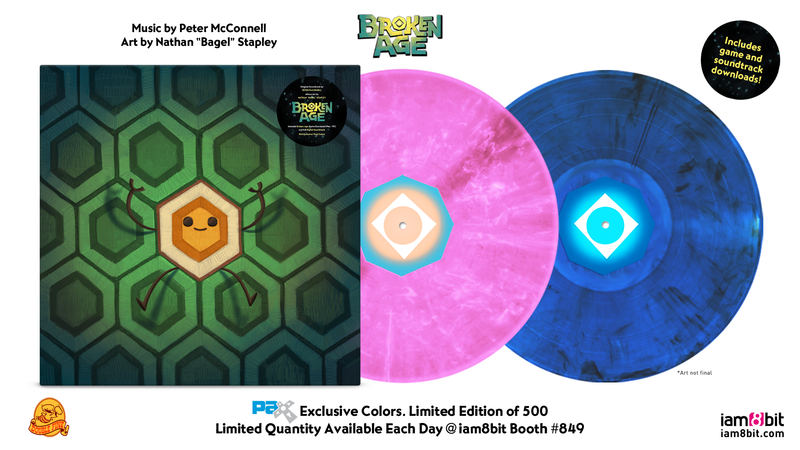 Even more excitingly, we’ve put together some super special limited editions with fancier coloured vinyl, and these will only be available at PAX West next week! Each one is limited to 500, and we’ll reserve a certain number to sell each day of the show. You’ll be able to get these limited editions from both our booth (#106) and the iam8bit booth (#849) throughout the show, until we run out! 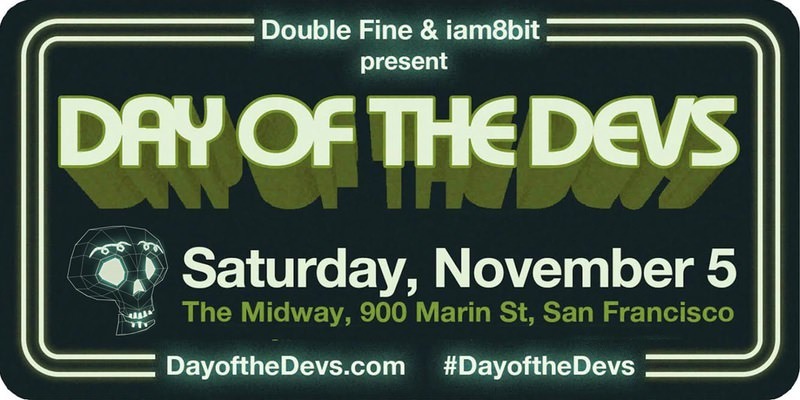 From: iam8bit Booth #849 & Double Fine Booth #106. 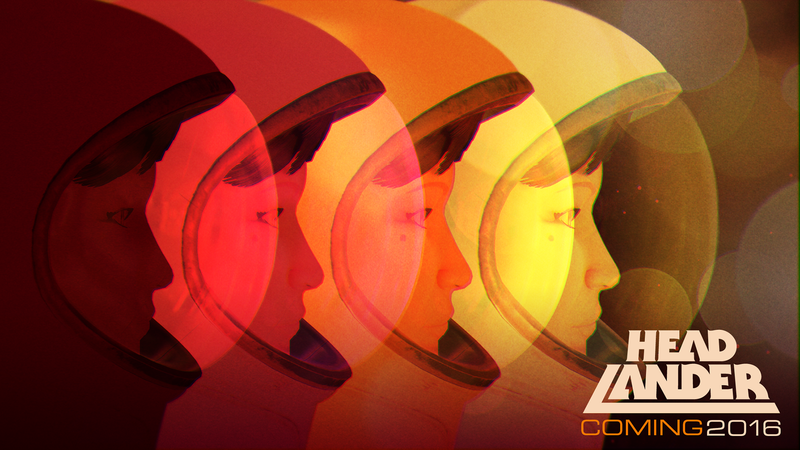 Headlander and its power-synth soundtrack are out today! Headlander is finally here! Download it today for your Playstation gaming console or windows powered home computing device! 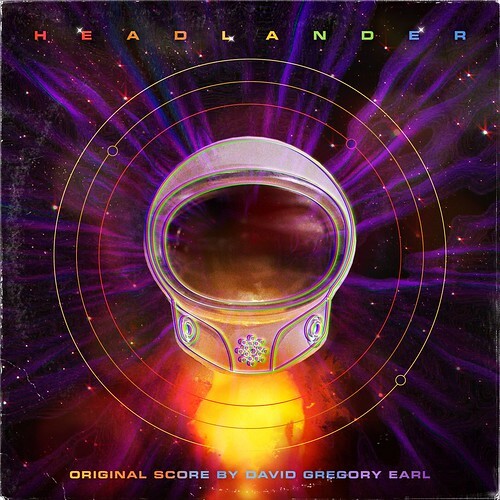 Also out today, the digital edition of the Headlander soundtrack by David Earl, available in a bundle on Steam. David wrote up an article about crafting the soundtrack for the PlayStation Blog, if you are at all interested in his tools and inspirations, it’s a great read! When I heard that Headlander was following a retro-future narrative inspired by Logan’s Run, Silent Running, Zardoz, and other 70’s sci-fi, I simply tapped my already fiercely nostalgic mind for content. I knew what influences I had to honor in this score, and knew what tools I was going to have to use to satisfy my needs. Right off the bat, I decided on using tape and analog synthesizers. I’d still use my software of choice, Logic Pro, but mostly just as a recording device…. 2 Player Productions put together a music video for one of the songs David wrote for the game, which features writhing robots and strutting Shepherds, and will ear-worm itself into your useless and outdated organic human brain head for all eternity. Watch it below! Day of the Tentacle Remastered is out now on iOS! Day of the Tentacle Remastered is out to day for iOS, for the incredible price of $4.99! Point and click your way around the mansion with your own finger tips. Bonus: now playable by tentacles! 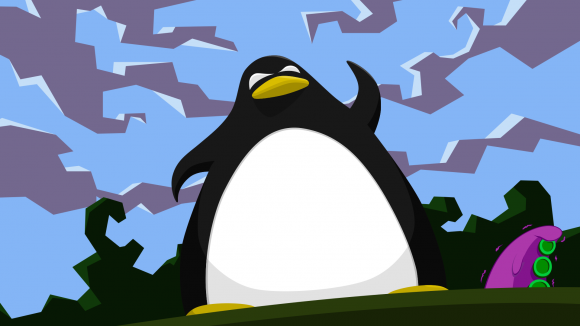 The Linux version of Day of the Tentacle Remastered is here, available via Steam, Humble and GOG, right now! To get this version up and running we recruited the help of our head forum moderator and resident Linux guru Cheeseness, who also made this desktop wallpaper to celebrate, thanks Cheese!